To expand: a generation of small people who are – it is said – addicted to screens and technology, stepped away from said screens and… went outside and played. What do we take from this? One: children are not as addicted to tech as we think they are. Two: children have not forgotten how to play. Three: children will play out, if what is beyond our front doors is enticing and welcoming enough. It is clear that children do not play out as much as they used to. 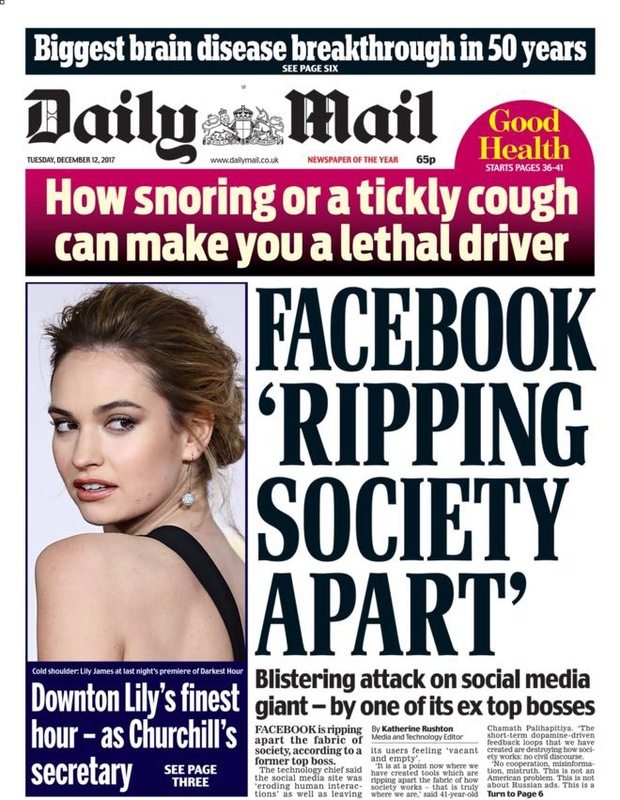 And – a few grumps aside – most people agree that this is A Bad Thing. As for the reasons behind this decline, many people put all the blame on parents. I don’t. There are all sorts of reasons why it’s harder and less appealing for children to be out of doors. And all sorts of reasons why it’s easier and more appealing for children to be indoors. But while the story behind the decline in outdoor play is complicated, the role of one factor – tech – is becoming ever clearer. I used to argue that children’s love of screens and gadgets was as much a symptom as a cause of the problem. And I still think there is some truth in this. Children have a huge appetite for stimulation and social contact. And if they are denied the chance to feed their appetite for experience IRL [In Real Life], they will feed it online. However, times are changing. We now have the smartest, most highly paid people on the planet, and the biggest global corporations, devoting huge sums of money to keeping us all on screens for as long as possible. We can all bear witness to the growth of the attention economy. And a growing number of us do not like what we see. Tellingly, this includes some of those very same smart, highly paid people. 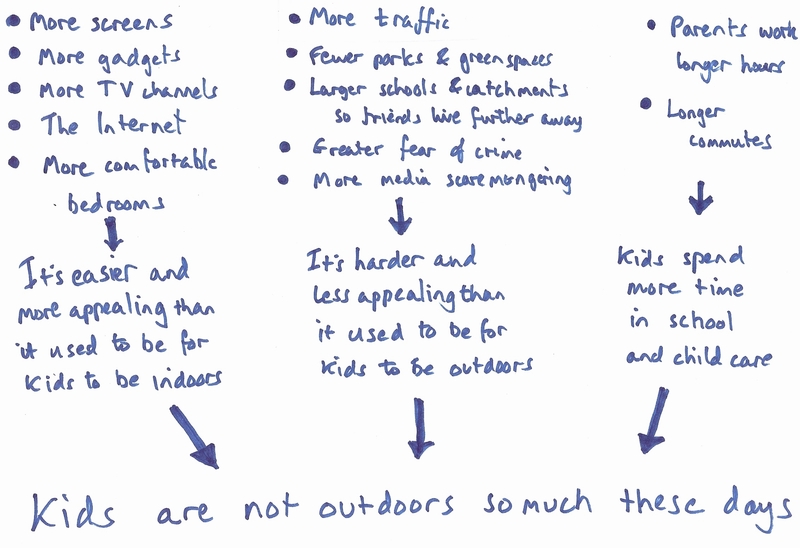 So if we want more children to spend more time outdoors and active, and less time indoors in front of screens, then reigning in the tech giants is part of the solution. But only part. We also need to look at the other side of the attention economy, namely the ordinary world beyond the internet. We need to look at parks, and schoolyards, and streets, and neighbourhoods. And we need to ask: how attractive is this ordinary world to children, really? We need to ask: how easy is it for parents, when they peer out of their front doors, to let their kids outside to have some fun with their friends? We grown-ups need to up our game. We need to make it really fun for children to play out, and really easy for parents to let them. We need to put up a fight for our children’s hearts, minds and spirits. And if you think this sounds like too big an ask, just remind yourself of the last time it snowed, and maybe you will think again. This entry was posted in Outdoor play, Technology and tagged Aldo van Eyck, outdoor play, parenting, snow, social media, technology. Bookmark the permalink. I was just about to recommend the great Aldo v Eyck as I read through your piece – and then I reached the end and of course it was in your head too. Worth reading Colin Ward too on children playing in snow but I can’t find the ref off the top of my head! Worth also considering the case of Pokemon Go, which used tech to entice children outdoors very successfully. I thought that this might herald a new dawn of augmented reality outdoors, but it seems to have been a one-off. That the makers, Niantic, did not win more approval for this is, I think, a symptom of the deeper problem. That we would like our children to spend more time outdoors, but are anxious when they do so. It is all so much easier when they are plugged in in the next room. Snow days are AMAZING reminders… Sadly none in Bristol this past week. Tim I often wonder, given the outside world is so unfriendly to children playing out, what would have happened (in a different version of our society developing) if screens had not developed in line with the barriers outside. Would parents and children have forced the issue by now?! Because surely they could not have been so inside, so inactive, so… alone .. for so long, without them.. and then what would have happened?! Thanks for your post. HI Ingrid, and thanks for stopping by. It’s an intriguing question. I’m sure that – to spin it around a little – the growth of tech has been massively fueled by children’s enforced retreat from the outdoors. Yes good point. A captive (literally) audience…! The impact of tech is still very close to my heart. It continues to blight our everyday lives both as adults and children. Of course it’s useful and has it merits too, but it is HUGELY addictive. Addictive enough that adults can’t control themselves – just look up at how many people are on their phones as they walk the streets these days because they can’t wait until they reach their destinations to check their phones. How on earth can we expect our children to manage their screen time if we can’t even manage our own? It worries me a lot. The clear answer? More snow days! 😉 And an onus on parents to realise the issue and impose screen time boundaries, plus opportunities to replace with something fun. Hi Ashley. Your point about adult engagement with tech is well made. Like so many aspects of childhood, our anxieties about the impact of tech on children are in part a displaced reaction to anxieties about how our own lives, societies and cultures are changing.